Embattled Baltimore Orioles first baseman Chris Davis broke the MLB's hitless streak record on Monday. Davis went hitless in his first three at-bats against the Oakland Athletics and is now 0-for-47 at the plate, dating back to September 14 last year. The 2013 All-Star and Silver Slugger now stands alone with the unwanted record after surpassing Eugenio Velez. Velez went hitless in 46 straight at-bats with the San Francisco Giants and Los Angeles Dodgers from 2010-11. Davis – who is hitless in 26 at-bats this season – lined out to right in the second inning off Athletics starter Marco Estrada. He then lined out to left in his next two at-bats and drew applause from sympathetic fans at Oriole Park at Camden Yards. Despite the three hard-hit balls, he had nothing to show for it. 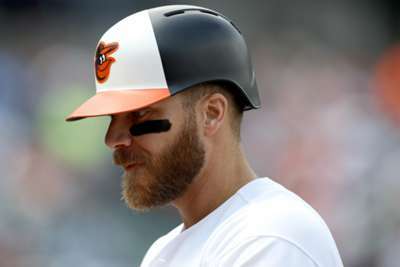 Prior to the game, Orioles manager Brandon Hyde said: "I talked to Chris after the game yesterday [Sunday], and he really wanted to play today. I put a lot of thought into it, and Chris is in there. "He's up front with it. We talk a lot about that. I don't want to hide anything. I don't want to try to mask his struggles. We're taking this thing head on. I appreciate that, too, that he's open to talking about things with me. "Inside our clubhouse, he's taking this head on. He's making every effort to ride this ship of tough times, to take good [at-bats] every day, and it just hasn't happened. You pull for him, but this is a results business, and I understand how the fans feel. I want to see him do well, too." Davis signed a seven-year, $161million contract with Baltimore after the 2015 season. In the first three campaigns of that deal, he hit .199 with a .296 on-base percentage and .391 slugging percentage.